Pharmacogenomics is a growing field that tailors dosage and drug choices based on patient genetic profiles with the potential to benefit millions of patients with personalized medical care while changing the world of medicine as we know it. One of the key obstacles faced by those working in pharmacogenomics is DNA sample collection. Traditionally, clinicians have used blood samples for DNA collection which are costly (requiring phlebotomy and cold chain logistics) and invasive (hindering patient compliance), making the clinical integration of pharmacogenomics difficult. Many researchers are turning to the idea of buccal and/or saliva swabs as a less costly and non-invasive alternative to DNA collection. However, the question is are these sample types of high enough quality for analysis? Ang JS et al at the University of British Columbia were determined to find an answer. They performed a study for the evaluation of two different oral swab types - dry-flocked buccal swabs (Puritan PurFlock®) and sponge-tipped swabs with stabilizing solution (ORAcollect) - to compare the yield and quality of the isolated DNA. 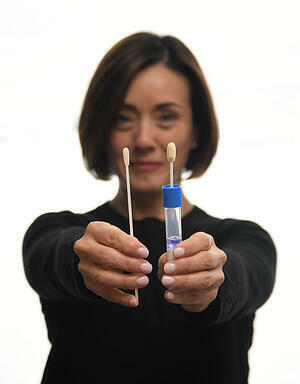 Thirty-one patients provided self-collected samples using both oral swab methods. The DNA obtained from each sample was compared for yield and genotyping quality on a pharmacogenetic panel of 28 single nucleotide polymorphisms (SNP) and a cytochrome P450 family 2 subfamily D member 6 (CYP2D6) copy number variation (CNV) assay. To validate assays, 44 DNA controls from the National Institute of General Medical Sciences (NIGMS) were also genotyped. DNA yield: ORAcollect sponge-tipped swabs had a significantly higher DNA yield (mean 1.91 ± 1.44 μg) than the Puritan PurFlock® dry-flocked swabs (0.26 ± 0.34 μg). 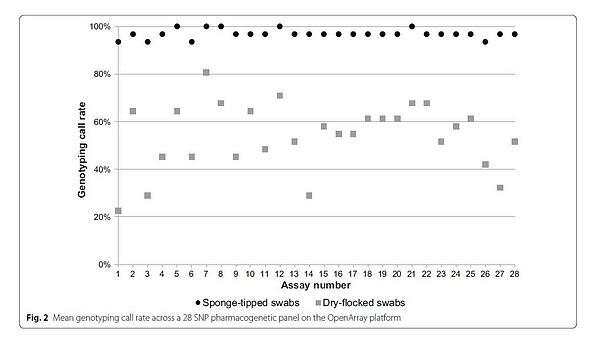 Genotyping call rates: ORAcollect sponge-tipped swabs resulted in a significantly overall higher genotyping call rate (97%) compared to dry-flocked swabs (54%). See Figure below. 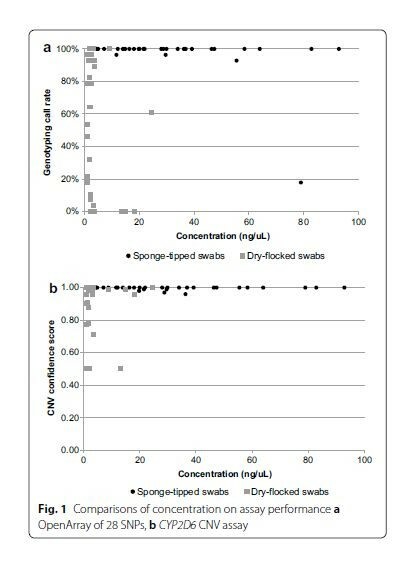 CNV confidence scores: ORAcollect sponge-tipped swabs had the highest confidence score over dry-flocked swabs for CYP2D6 CNV TaqMan Assay (99% vs 91%). A > 95% SNP genotyping call rate is considered to reflect acceptable quality data and CNV confidence score of 99% is considered high quality. See Figure below. With a non-invasive, stabilized and FDA cleared+ oral swab DNA collection device, pharmacogenomics is one step closer to mainstream clinical practice. If you are interested in evaluating ORAcollect•Dx for your own clinical needs, please email us at info@dnagenotek.com. +ORAcollect®•Dx has been FDA cleared for in vitro diagnostic use in the U.S.A. with the eSensor® Warfarin Sensitivity Saliva Test.